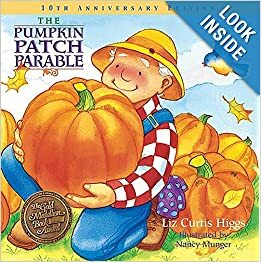 For those who are looking for a solid book about pumpkin carving that does not celebrate Halloween, may I suggest The Pumpkin Patch Parable, by Liz Curtis Higgs? Instead, this book relates the entire pumpkin's life process (seed, harvest, and carving) to God's love and our response...shining! Filled with Scripture, I really enjoy sharing this story with my children. In just over a week, I will spend the weekend with Liz Curtis Higgs. Unfortunately, I won't be her house guest or anything that personal, but I have the opportunity to attend her conference at a . (I live close enough that I will not be spending the night, but it will still be a retreat!) Liz will be talking about her book The Girl's Still Got It (linked to review) a book focused on Ruth from the Bible...line by line. This will be my second time hearing Liz, and I have enjoyed her writing for over ten years...children's fiction, Christian fiction, magazine articles, and her Christian non-fiction. I can't wait. 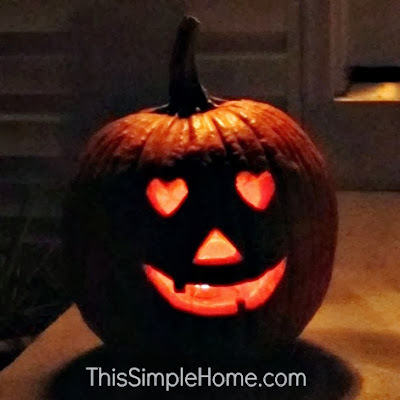 This is our carved pumpkin...a reminder of God's love! Our two big kids designed pumpkins on paper, and then my husband completed the carving. Both my son and daughter wanted heart eyes. How about that!? Can I warn you that carving pumpkins is messy business? We did it one other time, but I don't remember it being so hard! I love this book, it's so cute. We don't "celebrate" Halloween, but the boys typically dress up. With all these snotty noses today, I don't think "trick or treating" will be happening this year. We may try some pumpkin carving. I really like those heart eyes!! Love The Pumpkin Patch Parable.